Ten people are drawn to stay at an old hotel in a small Welsh village, and through their experiences there, re-evaluate their lives. The Halfway House (d. Basil Dearden, 1944) will always be seen in the shadow of Ealing 's follow up, Dead of Night (d. Alberto Cavalcanti/Charles Crichton/Dearden/Robert Hamer, 1945). Whereas the latter film has been consistently praised, The Halfway House has remained neglected and rarely seen. This is a shame, as the production is well made and engaging, and has a lot to offer the student of popular propaganda in the midst of the Second World War. In particular, Basil Dearden 's direction is assured, building tension from a complex arrangement of sound, characterisation and visual flair. The high quality personnel involved and the tight, professional scripting mark the film out as one of the earliest templates of what would become the traditional Ealing style. For an Ealing Studio production, however, there is a surprisingly high use of outdoor locations. The reason for this is the film's plot, and its theme of national identity being tied directly to the land. It is set in a distinctive part of Wales, and at the beginning of the film, each character is introduced with a title indicating their geographical location. The character Terence ( Pat McGrath ), who as an Irishman begins by professing support for his country's neutrality, seems finally to suggest a different interpretation: he ends the film by placing humanitarian concerns above national loyalties. As Britain was fully engaged in a war that was essentially over national sovereignty, such issues were an understandable concern. The film's status as a horror is perhaps questionable. But again, this must be placed within the context of the war, and the restrictions on the extent to which the filmmakers could have gone in this direction. When viewed in this light, the film's supernatural elements make for a much more effective piece of propaganda, restrained but pertinent to the concerns of the time. 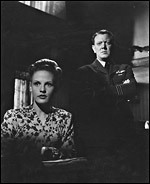 Like the characters at the hotel, today's viewers have the luxury of going back in time for a few hours and then leaving - audiences of the time could not shake off the film's ideas so easily, and its impact in 1944 would have been much greater than on someone watching it almost sixty years later.